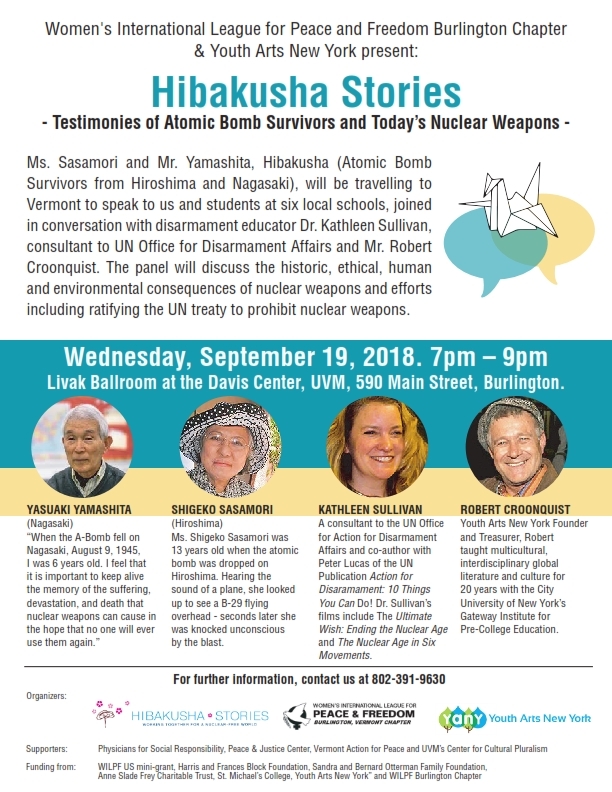 The Burlington Branch of the Women’s International League for Peace and Freedom (WILPF), Hibakusha Stories, and Youth Arts New York are sponsoring a Wednesday, September 19th event at the University of Vermont in the Davis Center’s Livak Ballroom (520 Main St., Burlington) from 7 to 9 pm. The free program, entitled, Hibakusha Stories: Testimonies of Atomic Bomb Survivors and Today’s Nuclear Weapons, will feature Yasuaki Yamashita (Nagasaki bombing survivor), Shigeko Sasamori (Hiroshima bombing survivor), Dr. Kathleen Sullivan (Hibakusha Stories), and Robert Croonquist (Youth Arts New York). The program will open with a short performance by Burlington Taiko. In July 2017, the UN Treaty on the Prohibition of Nuclear Weapons was adopted. The International Campaign to Abolish Nuclear Weapons (ICAN) won the 2017 Nobel Peace Prize for its work on the UN Treaty. The Bulletin of Atomic Scientists moved the Doomsday Clock to two minutes before midnight: the closest it has been since the Cold War. The US is currently planning to spend $1.5 trillion on new nuclear weapons and delivery systems. Despite an initial summit between President Trump and Kim Jong-Un, the threat of nuclear war still looms heavy over the world. We are at a time when everyone must work together towards a world without nuclear weapons. They are a threat to our lives, dignity, and planet. The average age of Hibakusha (atomic bomb survivors) is now above 80; many of these survivors will not be with us for much longer. Vermonters of all ages–but especially the younger generation—will have the opportunity to hear the first-hand experience of two Hibakusha and come to understand the destructive, inhumane and indiscriminate nature of these weapons. Attendees at the September 19th program at UVM will get to hear stories from these survivors and discuss the future we would like to create together. From September 18th to 20th, Hibakusha will be speaking to over 2500 high school and college students in Chittenden County. High school students at Burlington High School, South Burlington High School, Rice Memorial High School and Champlain Valley Union High School, along with college students at St. Michael’s College and the University of Vermont will all be participating in this educational program. At each school, a large auditorium presentation will feature Hibakusha testimony, followed by nuclear disarmament educational workshops in art, history, English, and other classrooms. In both the auditorium presentation and in the educational workshops, direct connections will be made to local issues and local groups that are working on related concerns. Nuclear disarmament educational materials will be made available to the schools, and WILPF will work with educators to develop long-term relationships for peace education that will continue beyond the Hibakusha testimony. All three program sponsors have a long history of work in peace education. The Women’s International League for Peace and Freedom (WILPF), Youth Arts New York, and Hibakusha Stories are all partner organizations of the International Campaign to Abolish Nuclear Weapons, the 2017 Nobel Peace Laureate. The Burlington Vermont Branch of WILPF is a part of the oldest women’s peace organization in the world, boasting two Nobel Peace Prize winners: Jane Addams and Emily Greene Balch. WILPF envisions a transformed world at peace, where there is racial, social, and economic justice for all people everywhere. The mission of Hibakusha Stories is to pass the legacy of the atomic bombings of Hiroshima and Nagasaki to a new generation of high school and university students to empower them with tools to build a world free of nuclear weapons. Hibakusha Stories has provided programming to more than 32,000 students and facilitated staff development for NYC high school teachers in disarmament education in collaboration with the UN Office for Disarmament Affairs. Hibakusha Stories in Vermont is supported by Physicians for Social Responsibility, the Peace & Justice Center, UVM’s Center for Cultural Pluralism, and Vermont Action for Peace. Funding for this project has come from a WILPF US mini-grant, WILPF Burlington VT, Harris and Frances Block Foundation, Sandra and Bernard Otterman Family Foundation, Anne Slade Frey Charitable Trust, Youth Arts New York, St. Michael’s College, and UVM. For more information, contact 802-391-9630.